Interior systems professionals are experts in the installation of partitions and fixtures in commercial and public buildings, including acoustical ceilings, computer access flooring, metal framing, wall partitions, office furniture systems, and both custom- and factory-produced materials. What Is an Interior Systems Carpenter? Most of the buildings in your community—from your high school or dentist’s office to the mall or your favorite restaurant—were built with the contributions of skilled carpenters. 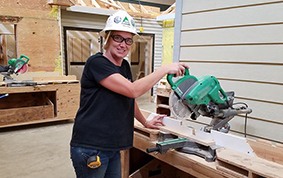 The expanding industry of interior systems carpentry offers a challenging, fulfilling career choice to those entering the construction trades. What types of jobs are done by Interior Systems Carpenters? These specialized workers install construction materials and a variety of factory-produced systems in commercial buildings and public structures. Their specialized skills come into play as they assemble complex interior systems using technical data supplied by manufacturers. The tools of interior systems carpenters include saws and hammers as well as mechanic’s tools like drills, wrenches, and screwdrivers. Welding skills may also be required for assembly work.